So I know salads are not typically a Sunday thing. 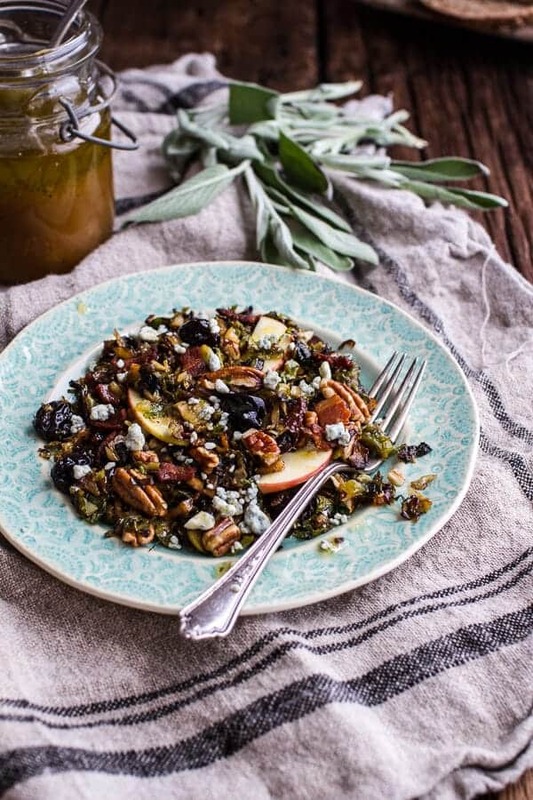 But this Caramelized Brussels Sprout Salad just seemed like more of a Sunday thing. I mean, this is not your typical salad, and to be honest, it is more of a side dish than a salad. This is a warm salad with all the fixins. 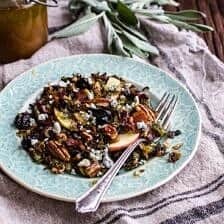 There are caramelized brussels sprouts, apples, pecans, crispy bacon, blue cheese and the sweetest, savoriest caramel apple vinaigrette that can be kind of addicting. Can you tell I am ready for the official start of fall on Tuesday? I have tried so hard these last couple weeks not to be too heavy into fall-like foods, but as of last Friday, I pretty much just gave up on that. Falls foods are my favorite, and every year the season flies by even quicker. So I hope you are ready for apples, pumpkins, pomegranates, roasted everything and lots of sweets. Come on, that totally makes you excited. You know it does. Ok but anyway, I am eager to tell you about this salad because it’s another post for my favorite pasta company DeLallo. 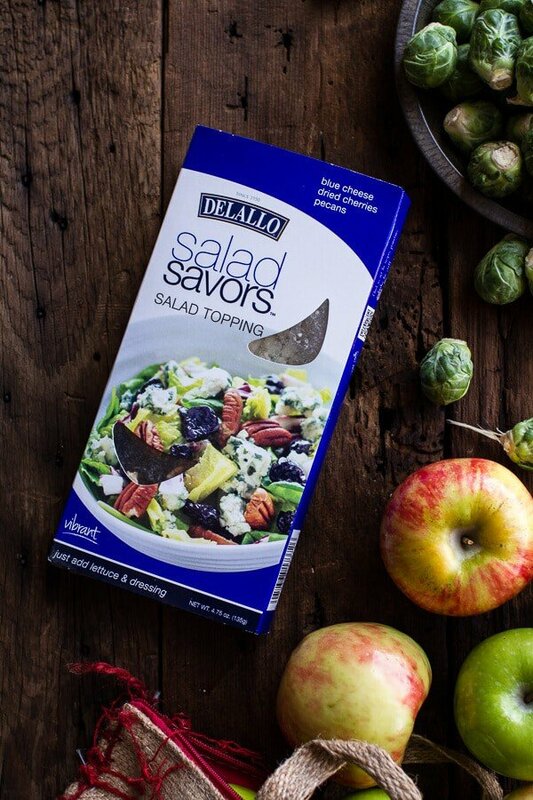 DeLallo has created a line of “salad savors” and they are the coolest thing ever. Basically the idea is that the salad savors give you all the toppings every delicious salad needs. All that is left for you to do is add some greens, maybe a protein if you are into that, or maybe a fun dressing. It makes dinner prep SO easy and convenient. Today I am showing you how I used the Vibrant Blue Salad Savors. I took the pecans and dried cherries out of the DeLallo Salad Savors box and stirred them into a mix of caramelized onions and apples. Perfect for fall, right?? Then I needed a dressing, so for some reason a caramel apple vinaigrette sounded pretty darn good. I love sweet and savory flavors together and that is this salad. Last up – I took the blue cheese from the Salad Savors box and sprinkled it on top of the salad. This is definitely a side salad, actually now that I am thinking about it, it is sort of perfect as a Thanksgiving side. I know, Tieghan shut up, it is not even October. But hey, just thinkin ahead for you and bonus that it is such an easy salad to make. When I served this for dinner, I made it into more of a heartier salad by adding a fried egg and a side of creamy polenta. Delicious either way. If you’ve never had caramelized brussels sprouts, now is the time to start. Plus, if you start now, you will still have all of fall + winter to eat and enjoy them. Caramelization makes everything so much better, and caramelized brussels sprouts are one of my favorites. 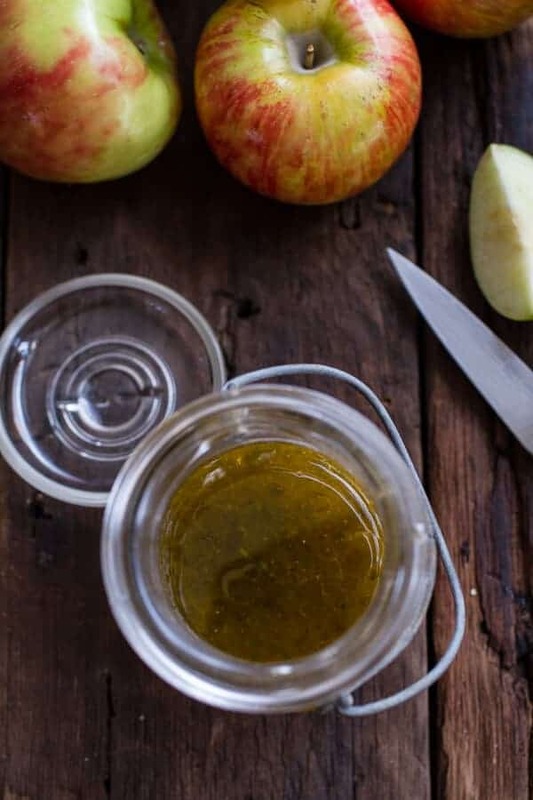 Top them off with these DeLallo Salad Savors toppings and this caramel apple vinaigrette dressing and you’ll have a salad that everyone will love. 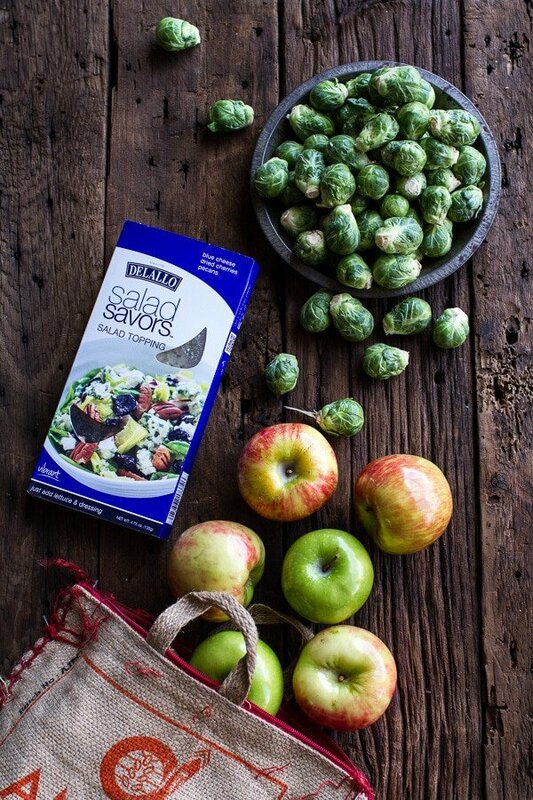 And how cool is the idea of Salad Savors? I love it! *This post is sponsored by DeLallo Foods. All opinions are of course my own. 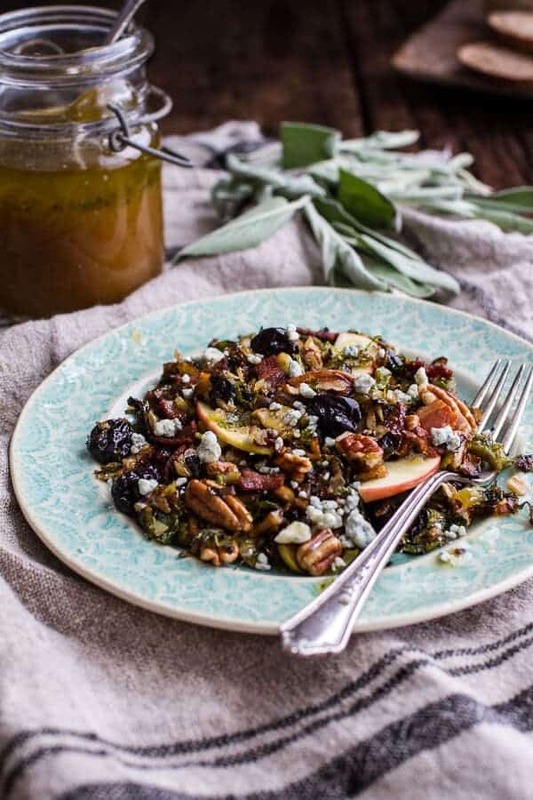 Caramelized Brussels Sprout Pecan Salad w/Bacon + Caramel Apple Vinaigrette. This is a warm salad with all the fixins. 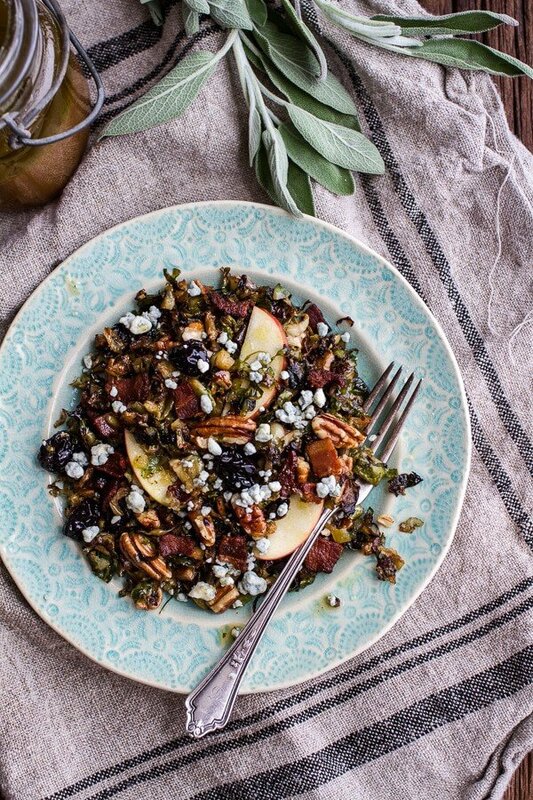 There are caramelized brussels sprouts, apples, pecans, crispy bacon, blue cheese and the sweetest, savoriest caramel apple vinaigrette that can be kind of addicting. Heat a large skillet with high sides over medium-high heat and cook bacon until crispy. Remove to a paper towel-lined plate. Remove all but one tablespoon of bacon fat from the pan and then add 1 tablespoon olive oil, heat over high heat. Add garlic and saute for 30 seconds. Add the brussels sprouts and chopped onions in a single layer and sprinkle with brown sugar and salt. Let sit 1 minute and stir. Continue to saute for another 4-5 minutes, until bright green and tender. Now add the apples and cook another 3-5 minutes. 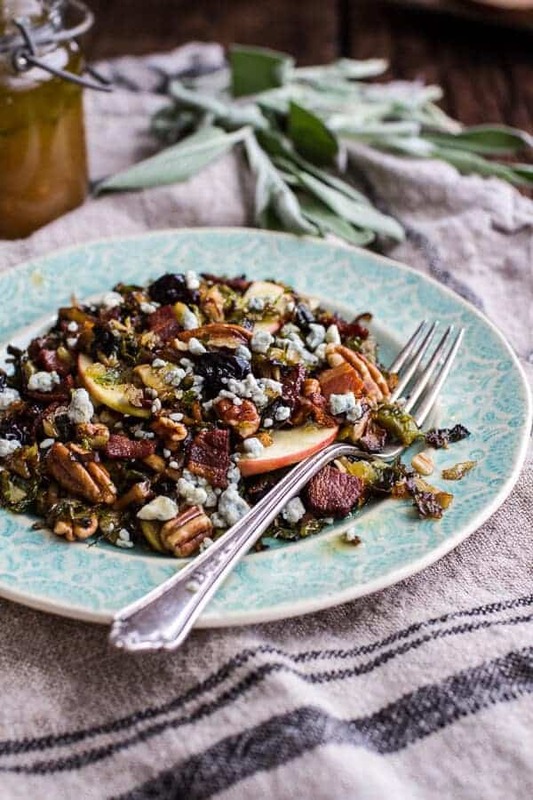 Remove the pan from the heat and stir in the the pecans and dried cherries from the Vibrant Blue SaladSavor toppings. Divide the salad among plates and top with Vibrant Blue SaladSavors blue cheese. Drizzle with the caramel apple vinaigrette and the crispy bacon. Add the apple cider, brown sugar and chopped apples to a medium sauce pot and bring to a boil, boil for about 10 to 15 minutes or until the cider has reduced to about 1/2 cup and is slightly thick and syrupy. Remove from heat and add the cider vinegar and sage leaves. Pour the mixture into a food processor or blender and add the olive oil, pinch of cayenne, salt and pepper. Pulse the vinaigrette a few time to mince the apples (do not puree the apples). Taste and season with more salt and pepper if desired. Keep the dressing in the fridge for up to 4 days. Oh and another idea – roast a chicken today, make this salad, and Sunday dinner is done. Bonus, the house will smell all kinds of amazing! 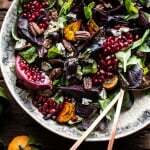 Winter Salad with Maple Candied Walnuts + Balsamic Fig Dressing (+ a big giveaway!). I love the sound of this salad, and although you’re promoting it as a side salad I’d have no problem eating this as a main. YUM! 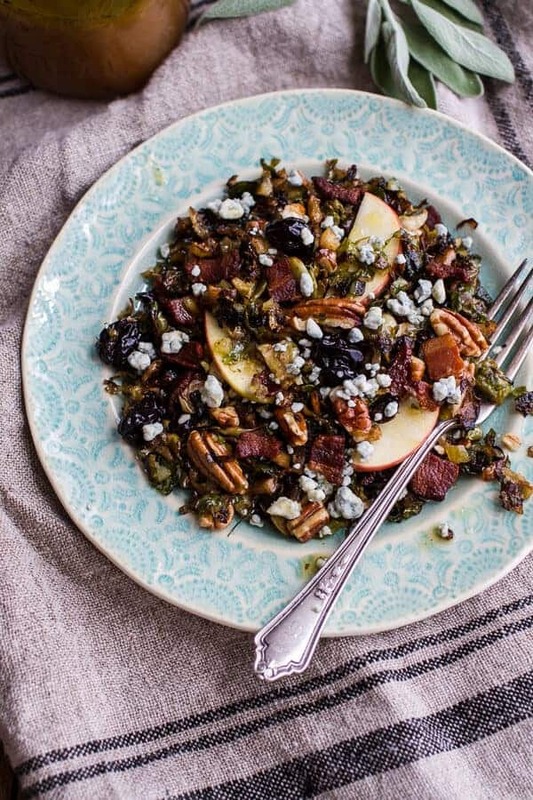 Tieghan, I love everything about this salad- the caramelized brussels sprouts and onions, apples, blue cheese… this just sounds like the perfect salad. And that caramel apple vinaigrette? YUM!! I wonder if I can get that Delallo topping in the Cincinnati area because that salad really looks good. Hey Nancy! DeLallo is is based out of Pittsburgh, PA and I know they sell a lot of product throughout Ohio too. I will find out for you. 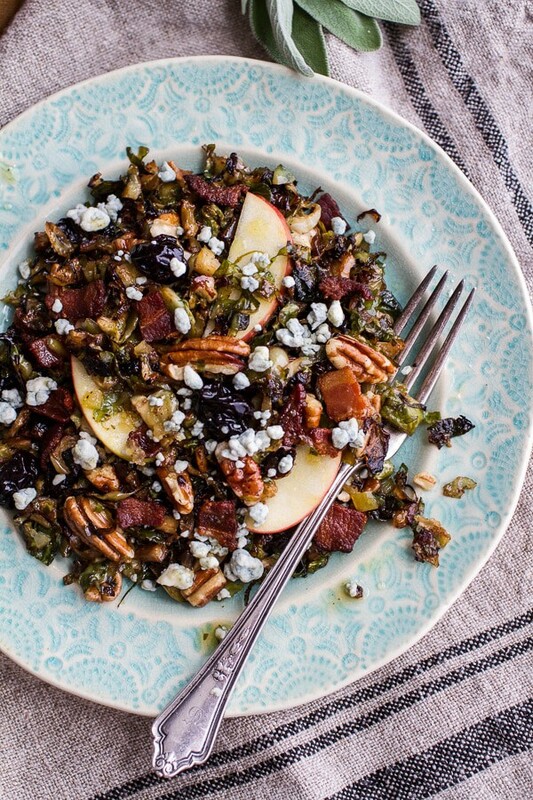 Brussels sprouts, apples, and bacon, such a dreamy combination! 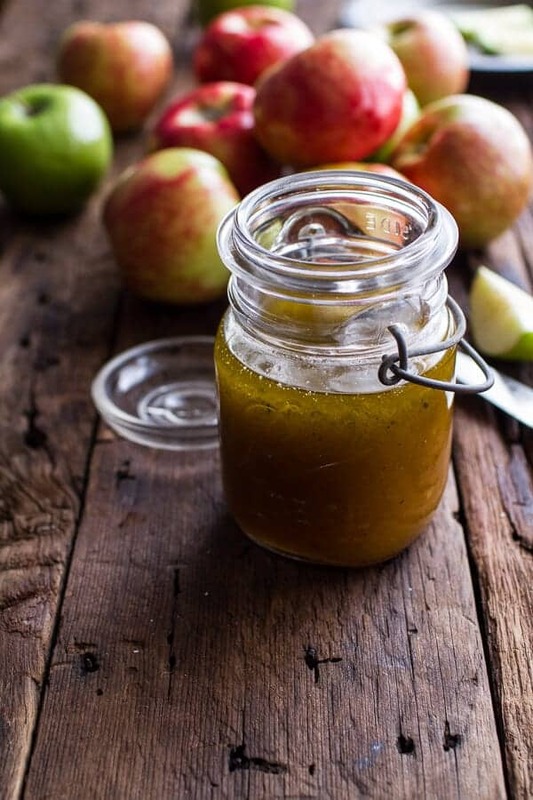 Wow, caramel apple vinaigrette sounds fantastic!! This looks like the kind of salad that could easily be made into a main dish (maybe with some wild rice or something added in)…yum! And I am definitely excited to see all the fall-themed pumpkin/apple/roasted things recipes that you come up with! I bet rice would be delicious! Actually, I am so doing that next time! So..umm…I have never had a brussels sprout. 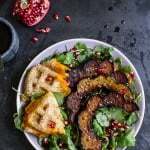 After seeing this recipe though I think i need to give them a try! oh no!! You have to try brussels sprouts, they are so good! Thanks Ashley and I hope you love brussels sprouts! 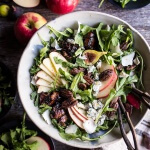 This is the perfect fall salad and that caramel apple vinaigrette is a must make! Thank you! Hope you had a great weekend! Has CA cooled off at all yet? This is my kind of salad – so awesome! Thank you, Lori!! Hope you and your family had a great weekend! Ahh!! I love Brussels sprouts AND apples, why haven’t I put them together in a salad before? This looks amazing, and the perfect dish to transition into the Fall season! Can’t wait to try it out! What a delicious combination!! I love Fall and brussel sprouts, so this is certainly something I’ll have to make. Thanks Amanda! Hope you had a great weekend! Happy Fall! I just picked up FRESH brussels sprouts from the market and am pumped to try your gorgeous salad. Hi! You can honestly just leave it out, no big deal. You could also use equal amounts pure maple syrup and honey. Hope you enjoy this salad! Waw! There are so many things I love combined in this recipe! such a Great combination! It made this salad tonight. So good! I omitted the sugar and it still tasted great! The apples made it sweet enough so that helped. I’m going to make this for Thanksgiving. Thanks for your recipe. Your very talented. So happy you loved it! Thank you! Looks delicious! If I make this a day in advance, what would be the best way to reheat it to keep the flavors and textures intact? Hey Anna!! I would reheat it in the oven at 350 or on the stove top over a low heat and if you want the dressing warm, just microwave it for 15 seconds. Hope you love this!! My family loved this! I grilled some chicken and added it on top and it was delicious. Thank you! Looks divine! 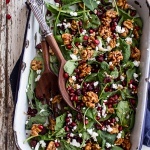 If I cant find salad savers, could I simply use pecans, blue cheese crumbles and dried tart cherries and if so what would the measurements be? Thank you! If you could provide nutritional info, that would be so great! This site would allow you to embed it. Hi Heather! I do not calculate the nutritional information for my recipes, so sorry about this! I just try to use more natural ingredients. What is 1 DeLallo Vibrant Blue SaladSavors® salad topping? We don’t have that here? This would go good with farro! Hello! This salad looks delicious! I don’t think I can find the salad toppers because they are not on the DeLallo website. (I’m not a fan of blue cheese anyway). Can you please give approximate quantity of dried cherries and pecans? Thank you!